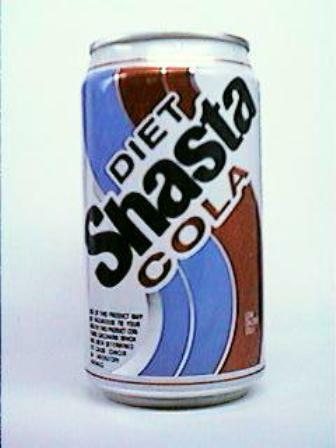 Gen Xtinct: Funky Food Friday: Shasta! Oh man, you have to watch this commercial. I wanna...pah pah pop! I wanna...SHASTA! We bought Shasta, because it was cheap I guess, and because you could sit there and fill up a box with your own flavor choices. Diet grapefruit was my favorite. Their cola was always a little off, like the guys at Coke or Pepsi were making a batch and then got called to the phone and left out a few ingredients. Did you drink Shasta, or were you a Pop Shoppe family? (We had both.) Or was there a regional brand of pop you liked? And yes, we're Minnesotans...we have to call it pop, not soda. Man, even the company home page still plays the jingle. Rock on with your so-retro-it's-cool self, Shasta Beverage Company. I love Shasta soda (and it was a rare treat when my mom let us buy anything beyond Coca-Cola products). Do you remember a Shasta Orange Soda commercial that had Barry Williams portraying a knight (full armor) and the whole group breaks into song and dance? Opening line: "What are we drinking, my Lord?" I liked the one with the girl in the red 80's outfit..."I wanna rock and rolla - I wanna poppppp I wanna Shasta!!" It always seems weird for me hear it called pop. I'm from NY, and it's always been soda. My brother went somewhere near you once and bought a soda and the guy at the counter said "Do you want your pop in a sack?' It took him a second to figure out he wasn't offering to bag my Dad - LOL! Any time day or night for the past 25 years, I could sing this song in it's entirity. Whatever DID happen to pudding pops?